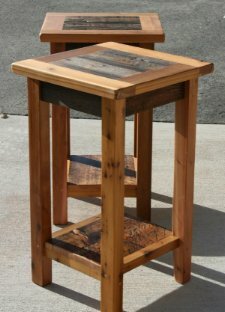 Jacob’s passion for woodworking took root during his years at Truckee High, where he repeated the wood shop course three times. After graduating from UC Santa Cruz with a degree in biology and summer stints as a tile layer, in 2007, Jacob and his wife Lindsey moved to Portola to start up his Rustic Tree Creations business. Searching for special chunks of wild wood, or taking someone else’s throwaway lumber, Jacob has a unique way of allowing each piece to speak to him, envisioning how it will best be utilized as functional art such as the pair of night stands he made from salvaged western red cedar and mixed reclaimed woods. Jacob also spends time scavenging old tools from antique shops and flea markets, refurbishing them for use in his craft. 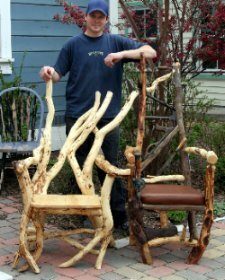 Recently, he took a group of unusable relics and made them into a chair that he calls his Rustic Chairmakers Chair. It won the People’s Choice award at the North Tahoe Arts Gallery May showcase. The whimsical Art Seat called Dancing In The Wind is a playful design from lodge pole pine branches—the legs dance while the back is blowing in the wind. The seat is fashioned from a reclaimed Turkish shipping crate. Those who try out this chair always remark on the surprising solid comfort despite its appearing as though it might whisk them away. For more information about Rustic Tree Creations, click here.